Last night I watched the third and final instalment of Adam Curtis' series All Watched Over by Machines of Loving Grace. You can catch it on YouTube if you don't have access to the BBC iPlayer. I'm still not sure what it was about. Episode 1 was a straightforward (or as straightforward as an Adam Curtis programme can be) exposition of the idea that Wall Street captured Washington in the 1990s and turned the IMF into a global enforcer for Big Finance. No argument here. Episode 2 was a quirkier essay on how the failed dreams of the hippies in the 1960s were channelled instead into Silicon Valley and the IT revolution we are still living through. Last night's episode was much darker: linking evolutionary psychology to genocide in Rwanda to our increasingly machine like indifference to the world around us. I think. But as with all such narratives about the rise of the machines, there is an unhealthy tendency to see humans as hopeless pawns in the digital hands of our new, silicon masters. This is nonsense of course. A recent RadioLab show on Talking to Machines explores just how human-like are the machines that Curtis and others fear. The answer is: they're not. 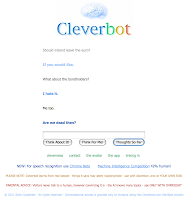 The show introduces us to Cleverbot - one of the leading examples of machine intelligence. If your conversational level doesn't rise much above 'what's the weather like?' then Cleverbot can sustain a convincing conversation of sorts. But chat to Cleverbot about something more challenging (Ireland's economic predicament, for example) and one quickly reaches the limit of machine intelligence. As you can see from the screen grab in the image above, Cleverbot is non-committal about Ireland leaving the euro. And hates the idea of burning the bondholders. 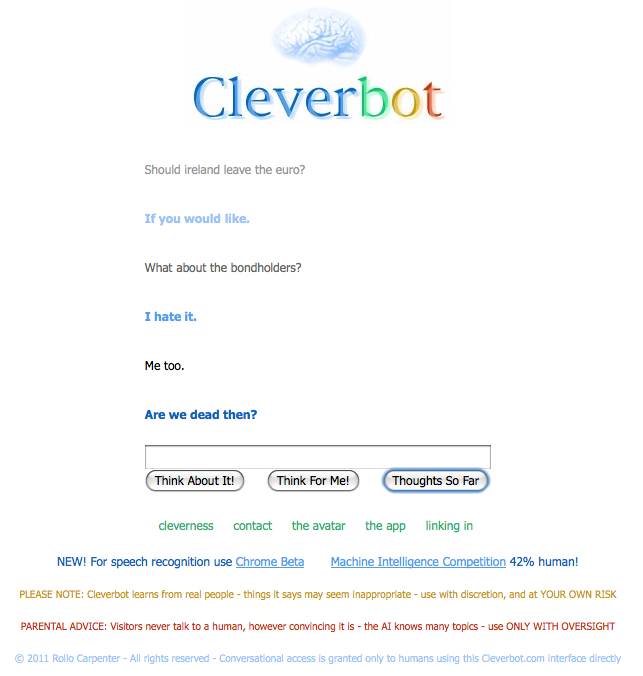 Though my questions were a little too taxing I guess: Cleverbot ends by asking 'are we dead then?'. Didn't get to see last nights one yet, but I have to say I don't think that the series was at all about the rise of the machines, but about a narrative that is either intentionally or inadvertently (depending on your proclivity to be a conspiracy theorist) limiting the options available to the average punter. Arguably this is the result of leaving the recording of "Pandora's Box" and "The Trap" alone together with some mood lighting and soft music. That said, I do like Mr. Curtis' work. Caught the last episode. My take on it was that ideas can be used to justify human atrocities, religion has done so in the past and is condemned by the secular for this reason, but ideas from science is none-the-less subject to the same problem, despite having an air of legitimacy that other ideas may lack. Essentially the over-all series seemed to be about the fact that scientific ideas, valid in their own narrow field, can easily be appropriated by the foolish or unscrupulous to forward their own agenda, while gaining the legitimacy of the "scientific method" for their ideas in a wholly disingenuous or flawed manner. The average punter, not knowing any better is then swayed more easily by the argument, potentially leading to awful consequences. - The danger comes from trying to make humans more machine-like. Norbert Wiener used the metaphor of the ant to explore this tendency. "The aspiration of the fascist for a state based on the model of the ant results from a profound misapprehension both of the nature of the ant and of the nature of man". Wiener goes onto to make his point over a good number of pages - including in depth description of the physiology and psychology of the ant and the human, and the implications for how the organisation of their respective societies SHOULD differ. "The point was made most elegantly by Norbert Wiener in The Human Use of Human Beings. Define 'man' functionally (the alternative, as a 'bag of chemicals', I find unacceptable), and he is at least an adaptive decision maker. To use him where neither choice nor adaptation are called for is not a human use. Conversely, automation never put a man (in this functional sense) out of work. If it does stop him playing the robot so much the better, for too much imitation makes us robot like. In particular, it is both distasteful and dangerous to regard man as a cheap substitute for an automaton - dangerous because there is a vicious circle and ultimately man will lose." Also, when I made the comment that 'promoting a minimum wage mindset is taking the wrong road' on your blog post 'no going back' the above was one of the things I had in mind.